This dredge has a 107 foot ladder and was originally designed for a diamond mine near the Arctic Circle. It was shipped over the infamous Ice Roads twice. 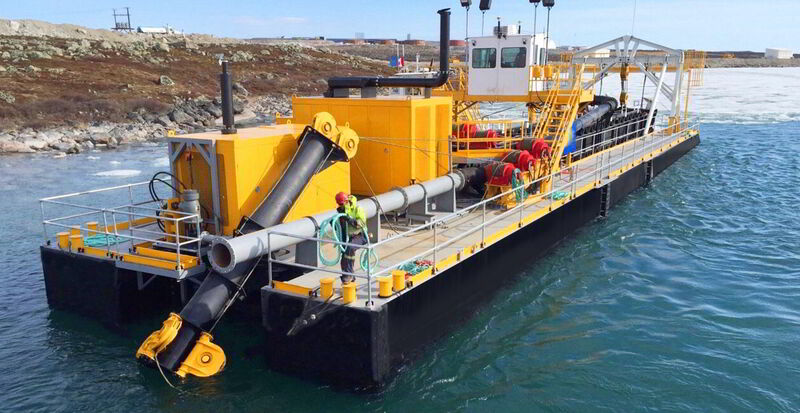 This dredge utilizes a “christmas-tree” tail winch system. The diamond mine project was a tremendous success. This dredge is now back in the USA making excellent production for a large Frac Sand mining operation. This dredge is a showcase electric dredge for one of the preeminent sand & gravel producers in the Illinois/Indiana region. This dredge is specially designed to dredge Fly Ash and effectively cut Bottom Ash. It was christened the Peggy Sue in December 2017, and is making excellent production for one of the largest Fly Ash dredging contractors in America. Custom Dredge Works is a family owned business founded by the father-son team of CJ Jones and John Jones. As in all companies, the culture, environment and demeanor of a company starts at the top with its leadership, which in turn influences all employees and all aspects of the company’s operation. At Custom Dredge Works the culture is one of FAMILY and EXCELLENCE. Prior to starting Custom Dredge Works, CJ began the fabrication company that became the shop for Custom Dredge Works. The original metal fabrication company, which started in 1982, is still in business and operates under the moniker: MidWestern Metals (MWM). Over the decades, MidWestern Metals has engaged in a large number of customized metal fabrication projects including projects for the US National Guard Helicopter Division, Ford Motor Company, KCI Incorporated, Dearborn Midwest Conveyor, and a wide assortment of customized industrial projects. It was MWM’s reputation as an expert metal-fab shop which prompted a local aggregate mining operation in Topeka, Kansas to approach MWM to have their dredge overhauled and upgraded in 2000. The results of this project were so impressive that the mining operation asked MWM to build a facsimile of their existing dredge. The mining operation was so pleased that they ordered a second dredge and a booster pump. This sudden success in dredge manufacturing inspired CJ and John to establish Custom Dredge Works, Inc. in 2001 as a subsidiary of MidWestern Metals. Local word-of-mouth advertising around Kansas, Iowa and Missouri, provided more dredge orders, rapid growth and established Custom Dredge Works as a significant dredge manufacturer in the mid-west. Martin Marietta approached with an order for two large dredges. As one of the largest aggregate production corporations in the nation, Martin Marietta’s orders served as a springboard for Custom Dredge Works thrusting us into the limelight on the national stage. 2010 Custom Dredge Works began to produce dredges specifically designed for the lakes, rivers and coastal waterways of the US Dredge Contracting industry. Since 2010 many Dredge Contractors have entrusted Custom Dredge Works to work very closely with their ownership and staff to carefully design and develop a customized dredge specific for their unique needs and objectives. Through these experiences Custom Dredge Works has grown into one of the largest and most respected dredge manufacturers for the Dredge Contracting industry in the USA. Custom Dredge Works is a proud Sustaining Member of the Western Dredging Association (WEDA). In 1985 MidWestern Metals leased a small space within a large industrial complex located in northern Topeka. Over the years as Custom Dredge Works was launched and grew exponentially in terms of production output and number of employees, MWM and CDW expanded their leased space within the complex many times to accommodate the growth. Eventually Custom Dredge Works and MidWestern Metals occupied the entire complex, which led them to acquire the entire property. They closed escrow in December 2015 on the property they now call their headquarters and home. The property consists of nearly 150,000 square feet of office, warehouse and manufacturing bays, and 20-acres of land that provides plenty of room to expand their facilities for increased production. Despite competitors who have been active in the dredge manufacturing industry for a longer period of time, Custom Dredge Works has emerged as the premier dredge manufacturer for the Aggregate Mining Industry as well as the Dredge Contractor Industry. Custom Dredge Works has manufactured a very large fleet of dredges of almost every conceivable size and characteristic and has enjoyed increased market penetration nationwide and high annual growth rates. Their dredges are utilized all over the USA as well as many parts of the world by their growing list of very loyal customers. In 2019 Custom Dredge Works is expanding its operations to increase output capacity. This expansion includes adding thousands of square feet and new buildings to their manufacturing facility, including a specialized Paint and Blast facility. Their planned expansion also includes more skilled employees to join their family, as well as new innovative leading-edge paint, metal fabrication, and hydraulic technologies. They are always adding more hi-tech computerized manufacturing machines to improve quality while increasing their rate of production. We encourage you to explore and compare our very specific skillsets. Our team brings a unique capability to build a World Class Dredge boasting features and benefits that can only be found in the Highest-Value Dredges. From design to maintenance and repairs… we’ll build a dredge and provide services to meet and exceed your most stringent requirements. Your new dredge will be specifically designed and built to excel in whatever hostile environment you call home… We extend to you an invitation to come visit our facility located in Topeka, Kansas to see why Custom Dredge Works is your ultimate dredge manufacturing partner. We know you’ll be impressed with our passion and capabilities for building the Highest Value Dredges in the USA. The various divisions that comprise the Custom Dredge Works’ manufacturing process are all domiciled together in our 20-acre industrial office/manufacturing complex located on the northern side of Topeka, Kansas. The close working proximity of our Design/Engineering teams, Component Procurement department, Fabrication/Assembly teams, and other skilled experts, naturally encourages system wide synergy and inter-departmental communications perfect for solving problems, overcoming challenges and heading off potential setbacks before they occur. Designing on CAD; Ordering components and parts; Cutting steel; Metal fabrication; Welding; Blasting and Painting; Assembly. All of these activities, and much more, are part of our well-orchestrated dance at Custom Dredge Works for building a world-class dredge. Each fabricated part, each industrial weld seam, each socket weld on the hydraulic lines, each pontoon and each individual component are carefully tested and measured by our Quality Control team for compliance with our exacting standards for safety, function, design and aesthetics. In addition, each dredge we build is fully assembled twice (once prior to paint and once after paint), and is inspected each time by our Quality Control experts with a detailed checklist of requirements. A 100% passing score is mandatory for each dredge, booster pump and bucket wheel prior to disassembly and shipment to our customers.